American Media Inc., parent company of the National Enquirer, today said it would probe the claim of Jeff Bezos, Amazon chief and Washingon Post owner, that the tabloid threatened to publish intimate pictures of him and girlfriend Lauren Sanchez unless he dropped an investigation into how NE acquired the photos. Bezos made his allegations in a Feb. 7 post on Medium, the online publishing platform. "American Media believes fervently that it acted lawfully in the reporting of the story of Mr. Bezos. Further, at the time of the recent allegations made by Mr. Bezos, it was in good faith negotiations to resolve all matters with him. 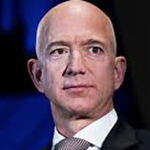 "Nonetheless, in light of the nature of the allegations published by Mr. Bezos, the Board has convened and determined that it should promptly and thoroughly investigate the claims.